It’s nearly time once again for the Ronnie James Dio Stand Up and Shout Cancer Fund’s annual Ride for Ronnie, which is in it’s fourth year now! This year’s event will take place on Sunday, May 6, 2018. The ride from Harley-Davidson of Glendale, CA to Los Encinos Park in Encino, CA will raise awareness and funds for cancer prevention, and research for a cure. The afternoon concert in the park will be hosted by radio and television personality Eddie Trunk, and feature live music from the various artists listed below. Last year’s Ride raised over $40,000 for the Dio Cancer Fund! More info on this year’s event and the Dio Cancer Fund below – read on! Once riders arrive at Los Encinos Park, they and fans/attendees will be treated to an afternoon of live music, raffle, live auctions, food trucks and much more. Steven Adler’s All Star Band is confirmed to perform again this year – last year’s All Star Band line-up included Mike Devin (Whitesnake), Lita Ford, Robert Sarzo (Hurricane), Alex Grossi (Quiet Riot), Patrick Stone (Budderside), and Jeff Pilson (Foreigner and former Dio guitarist). This year’s All Star Band members will be announced closer to the event. Also confirmed to perform are rock and metal heavyweights Dio Disciples, Beasto Blanco (featuring Chuck Garric and Calico Cooper), and more. 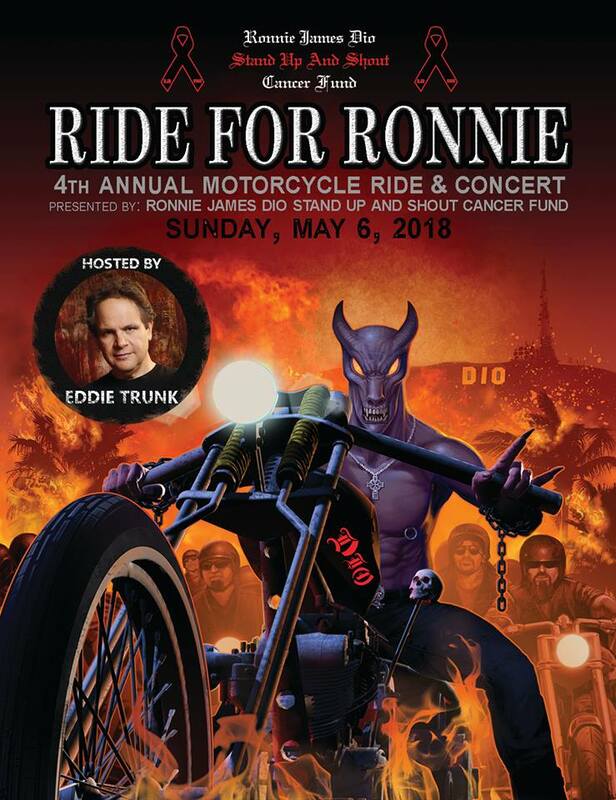 In previous years, celebrity appearances at the Ride for Ronnie have included cast members of Sons of Anarchy, Eddie Money, etc. Personally speaking, the Ride for Ronnie is an incredible event that creates an all-day environment of love and inspiration. It has a beautiful outdoor barbeque feel where everyone can mingle in the sun and enjoy heavy metal in the name of one of the greatest entertainers of our time. 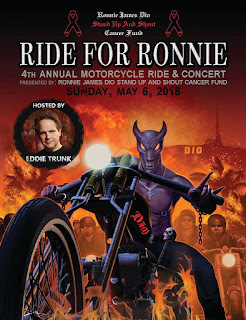 Wendy Dio and the Dio Cancer Fund have made it a mission to spread awareness of the importance of screenings and to hopefully find a cure for gastric cancer which took Ronnie James Dio’s life in 2010. Monies raised have been committed to the cancer research work of the T. J. Martell Foundation for Cancer, AIDS and Leukemia Research, the gastric cancer research unit of the M.D. Anderson Cancer Center in Houston, where Ronnie was treated for gastric cancer during the last six months of his life, and other cancer research projects. Most recently, the Dio Cancer Fund has committed funds to support the research of Dr. David Wong and his team at the UCLA School of Dentistry in developing a simple, non-invasive saliva test for the early detection of cancer, which is in keeping with the Fund's mission of cancer prevention, research and education. The Ronnie James Dio Stand Up and Shout Cancer Fund has raised nearly $2 million since its inception. Watch a video wrap-up of the 2016 Ride For Ronnie here: https://youtu.be/wp0VsyjLkq4.